On this page you are going to use piano notes to play some simple melodies on your keyboard. 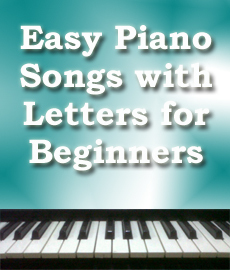 Yes, the main objective of this page is to help you use the letters of the piano keys to play simple songs. 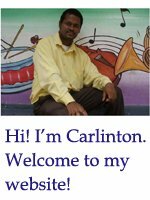 You don’t have to worry because all the songs presented for this lesson are simple and well known. As you learn to play each melody you are also learning to manipulate the keys on the piano and also strengthen your fingers for future lessons. It is very important that you follow all the instructions given for each activity. However, before you start playing any of the melodies provided on this page, there are some important information that you should take into consideration. First, you should be able to identify all the piano notes that are located on your piano keyboard. You should also be aware of the fact that there are 12 keys on the keyboard and these 12 keys are repeated several times in octaves. The 12 keys include seven white keys and five black keys. The letters of the white keys are A, B, C, D, E, F, G; these letters form what is called the musical alphabet. The letters of the black keys are C#, D#, F#, G#, A#. Now, some of these keys will be used to play the melodies prepared for you. To be more specific only white keys will be used in this lesson. For those of you who are new and do not know how to identify the piano notes on the piano, it would be best if you go to the piano keys page. 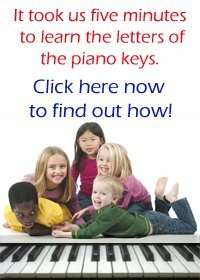 Click here to learn all the letters of the piano keys in minutes. I know you won’t regret reading the information provided. If you have been given any information about the notes of the piano keys before and you are having problems remembering them, I would advise you to go to the link above and refresh your memory. It is important to note that you will not be able to play the songs below without having a firm knowledge of the letter names for the each key on the piano or some would the “piano notes”. Before you try to play your first song, use the keyboard diagram below to assist you. This keyboard diagram will apply to all the songs presented for practice. 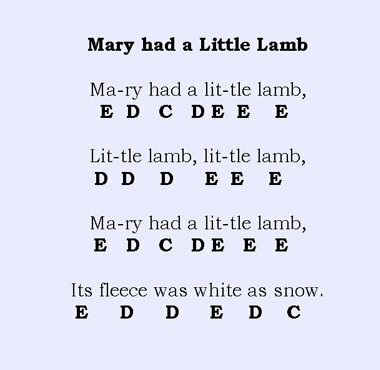 The first song that you will approach is “MARY HAD A LITTLE LAMB”. The keys you will use to play this melody are C, D and E. Practice with your right hand first and when you are able to play it fluently, try to play it with your left hand. 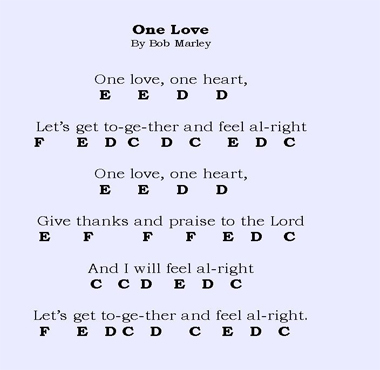 The second song is “One Love” by Bob Marley. Practice with your right hand first and then your left. 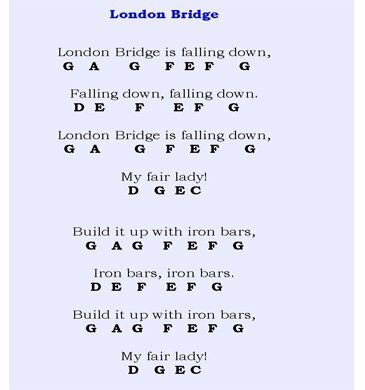 The letters you will use are C, D, E and F.
Here is another popular piece that you should practice - “London Bridge is Falling Down”. Take a look at the letters that you will to play this piece and then give it a try. Remember, practice with your right hand first and then your left. 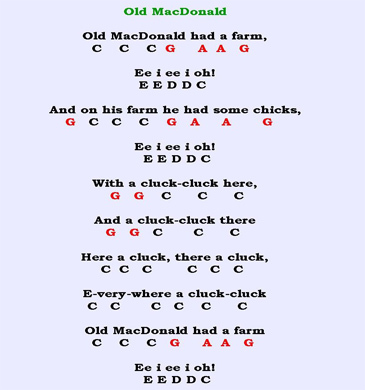 The final song that you should practice for this session is “Old McDonald Had a Farm”. This piece has some low notes in it G, A and B. These three notes are colour coded in red so that you will know the pitch range to use. When you are playing this piece you should pay close attention to the piano keyboard diagram given. I am sure that after you are finished practicing these songs and can play them fluently, you will be able to identify all the notes on your keyboard much faster. Once you are able to identify each note on the piano quickly, then you will have no problem moving to another level. Choose from a variety of piano notes books on Amazon.com! Click here to leave the piano notes page and return to home page!